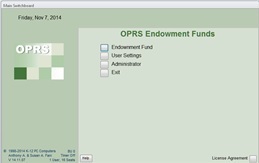 OPRS Endowment Fund provides staff with the tools to record and manage donations that are directed to the Endowment Funds. Record donor information and donations to endowment scholarships and funds that have been established by the parish or school. There are many reports that help staff send donors thank you letters and statements for tax filing directly from the software. Additional reports provide important information to the administration board about the funds growth.